The A Cappella comunity is one of the best communities I can think of. Our shared passion brings people from around the globe into near instant friendships. Yesterday, it was announced that Boston vocal rock band Ball In The House would be cancelling Saturday’s scheduled show (two days later) because of a sudden and sad death in the family of one of the members. One day later, it has been announced that Boston’s other outstanding vocal rock band, Five O’clock Shadow, would be stepping up to the plate and covering the gig for them. That’s just one of the nicest, coolest things I’ve heard in a while. I’m sad to hear of the death, and I’m sad for those attendees who were looking forward to seeing BitH, but at least they’re still getting a rocking show with FOCS. This entry was posted in News on January 8, 2010 by Chad Bergeron. Are you in the Philly/Wilmington region this weekend? And even better? The price – only $15, which is what you might expect to pay for just one group’s end-of-semester show. If anyone goes, send me pictures from the event and I’ll send you an Acapodcast sticker. This entry was posted in News on December 1, 2009 by Chad Bergeron. Pardon me while I crawl out of my bunker for a few moments to tell you about AcappellaFest! 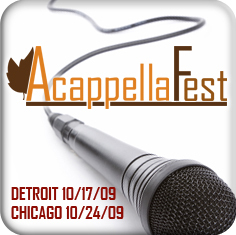 Now in it’s third year, AcappellaFest is the MidWest’s -finest- A Cappella event. And this year, it’s too big for any one city to contain! It’ll be in Detroit on October 17th, and in Chicago the following weekend of the 24th. All the details are available at http://www.acappellafest.com/index.html, but to summarize, it’s all sorts of great groups, special guests, workshops, and contests! Listen to AcappellaFest Radio Spot and tell me it doesn’t get you excited! And if that’s not enough, go check out an interview with Jeff Swearingen, one of the executive producers of the festival – great stuff! This entry was posted in News on October 7, 2009 by Chad Bergeron. If you -still- don’t own “…Sings Without Music, Vol. 2” from Firedrill! then you should go listen to the latest episode of Mouth Off (and subscribe to their podcast) because they give an excellent overview of the album and why you should own a copy. The best line from the review? When they tell everyone who listened to the (oh so disappointing) Ben Folds acappella album that they should listen to SWM,V2 to cleanse their ears and find out what acappella is -supposed- to be. Dave and Christopher put me to shame again…. This entry was posted in News on July 29, 2009 by Chad Bergeron.